The origins of this organ are unknown, though it may have been made in Hamburg and spent all its life there till 1938. It is so far as we know unique, though such organs may once have been common. Derek Adlam told us that the keyboards are typical of late 18th century Hamburg keyboard instruments (red scribe lines on the naturals, long naturals and sharps and paper fronts). 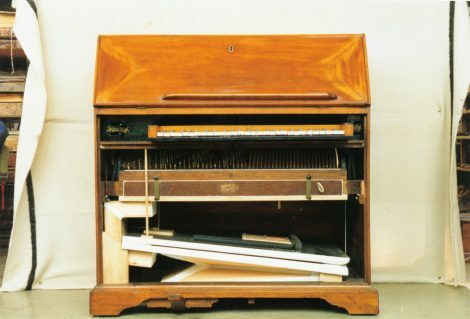 The variable quality of the different parts of the organ suggest that it may have been rebuilt from existing parts. The case has a superficial resemblance to English furniture, which Derek Adlam tells us was a feature of furniture from the Hamburg-Schleswig-Denmark region at the end of the 18th century.